I don't often post reviews of middle grade books, but this one was too fantastic not to review. Read on! Ten-year-old Star Mackey is the only girl in her class that lives in a trailer park, and she’s sure if she can show her new classmates that living in a trailer park isn’t all that bad, she can make friends. But the kids who show up to her ill-fated Trailer Park Club aren’t exactly who Star was hoping to make friends with, until her club takes a different direction and Star is introduced to Emily Dickinson’s poetry and the meaning of friendship and hope. 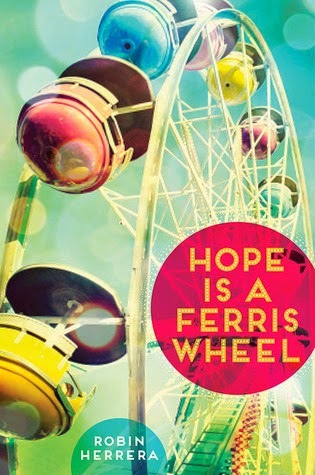 Hope is a Ferris Wheel is charming and heartfelt, written in Star’s clever and humorous voice. Through weekly vocabulary lists, poetry, Star’s relationship with her teenage sister, and various attempts at launching clubs at school, Herrera explores Star’s life and her self-identity. Herrera handles the issue of poverty in Star’s story particularly well. It’s not a tragic element or a reason for Star to doubt herself, but a fact of life that illustrates how Star relates differently to her peers. Star is particularly resourceful and thoughtful as she discovers her creative voice, learns how hopes connect to dreams, and as she comes to terms with the complicated fabric of her family life. This is a fantastic middle grade debut, honest and entertaining. Cover Comments: I love this cover--it's beautiful and bright and just has a lot of fun shapes and colors. Book purchased from my local indie. The Ring and the Crown Giveaway!